Kaal Sarp Yoga Shanti Puja is performed to mitigate Kaalsarpyog which is formed when all seven planets come in between Rahu and Ketu. 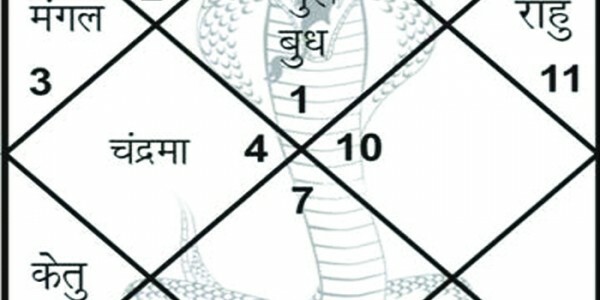 Kalsarp Yoga is created when exactly half the natal chart is unoccupied by planets and if there is exclusion of even one single planet then Rahu-Ketu Axis does not signify the Kalsarp Yoga. If any individual has taken birth in this Kaalsarpyog then they suffer tensions, insecurity, and fear alongside also have a constant fear from death. We, at Puja Yagya provide best solution of this as per the methods mentioned in Veda as apt solution of this Dosh in very essential because it is considered as one of the most malefic Doshas. Due to its negative implications on people's life solution of this Dosh is very important for anyone’s healthy life. Kal Sarp Dosh or Kalsarp Yog can bring so many problems like it can create losses in business, or can be responsible for child problems or family problems or even sometimes fear of death etc. Its negative power varies from person to person and that’s why needed solution is provided after studying natal chart of individuals by our Gurukul trained Purohits. Different types of KalSarpa Dosha: • Anant KalSarpa Dosha • Kulika KalSarpa Dosha • Vasuki KalSarpa Dosha • Shank kalSarpa Dosha • Mahapadma KalSarpa Dosha • Vasuki KalSarpa Dosha • Takshak KalSarpa Yoga • Karkotak KalSarpa Dosha • Shankhnaad KalSarpa Dosh • Paatak KalSarpa Dosha • Vishakt KalSarpa Dosha • Sheshnag KalSarpa Dosha We conduct Puja for you for keeping you away from the malefic effect of this dosha in the most effective Vedic manner. Our Pundits are well trained in Vedic Pujan and hence we ensure solutions of such dosha quite effectively.